Cowan Pettigrew’s goals for KPMG don’t sound that much in line with what you’d expect from one of the big four global auditors, known for its financial audit, tax and advisory services. 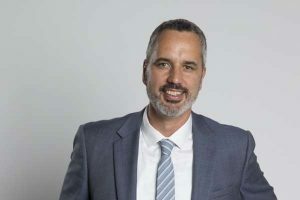 The CIO of KPMG New Zealand wants to make it as easy, robust, streamlined and personal for customers to order services and get in touch as it is to order something from Amazon and to make joining KPMG as easy as ordering pizza online. The 100 percent Kiwi owned business is undergoing its own digital transformation to drive stronger customer insights, while also providing a helping hand for other Kiwi companies looking to reinvent themselves digitally. For KPMG New Zealand, the move has unleashed new business opportunities, with the upcoming launch of a robot-as-a-service offering – more on that later – as well as internal changes. “When I ask companies what does digital mean to your company, by and large most people stumble then and there,” he says. “They go, well, it’s um, it’s getting some stuff on my phone or turning our workflow into a digitised manner. But they really struggle to answer what they are looking to achieve in this digital transformation or digital strategy they’re doing. Key then, are understanding exactly where a company wants to go, its vision and the subsequent operational mission statements, with the CIO then putting in place plans to digitally support that. “If you haven’t made those links then many CIOs will run the risk of doing something digitally that really doesn’t produce the one commodity that digital transformation should deliver back: time,” he says. In this case, KPMG’s vision is to fuel New Zealand’s prosperity and Pettigrew has an ‘outside-in’ (customer-first) focus for the DX, which is driving a desire to deliver client-facing digital platforms. Pettigrew, who took on the role in 2016, started with centring the business around a platform, which would enable them to focus on the single platform they knew served their market well, and ‘discard all the other noise around every other app coming out every day’. A Microsoft Gold partner, KPMG New Zealand selected the Microsoft Office 365 suite, including all the power apps. Mindful of the potential for new disruptive technology coming at any time, Pettigrew – who is ex-Army and police, something he admits has baked security and quick reaction forces into his everyday thinking – and his team have built an application service bus that has the capability to rapidly ingest new applications. “If something came out tomorrow and the business said we’ve got to make use of it, I’ve got a team, you can grab an app and start integrating it. It sounds simple, but Pettigrew says for a number of CIO’s the ‘I’ in their job title doesn’t stand for information, but for infrastructure: “Historically, they been focused almost with the mentality of just keeping the lights on. “But being a CIO these days is about expanding your reach into the business, saying ‘how can I be delivering client-facing solutions or solutions that can be externalised?’,” he says. Remember that robot-as-a-service/automation-as-a-service we mentioned earlier? It’s another of the transformation projects Pettigrew and his team have been working on. While the service was tested internally and will continue to be a driver in KPMG’s internal efficiencies – it is being used across the business including for back office functions and employee on-boarding – it will launch to the wider market soon. “It’s about helping the business achieve its strategic goals – in this case KPMG fuelling New Zealand’s prosperity. I don’t do that by building a back end RPA service, I do it by building an RPA centre of excellence that can be used internally, but can also be sold as a service. In automating systems, Pettigrew says it was key to have some guiding principles, including having no human intervention. It’s an issue he sees beyond automation too. “People often digitise one part of the process only. So Person A in finance is happy, they’re work has been digitised. And Person B, the next person in the chain is going ‘what a disaster, I’ve just been handed a hospital pass from a digital process that has now tripled my workload. “That happens all the time. You’ve got to see the entire process through and it has to deliver time, or a return in some form, back every step of the way. He’s adamant too, that all systems implemented must meet the FAANG effect – where applications need to ‘collaborate like Facebook, enable procurement like Amazon, look as cool as Apple and allow users to consume media like Netflix and search like Google’. But he says, if you’re smart in selling a project to management, it’s hard for them not to resource it. Pettigrew uses TBM, a methodology to communicate cost, quality and value of IT investments. If he’s passionate about digital transformation, he’s ‘not far off’ being evangelical about TBM, proclaiming ‘all CIOs should be using it, it’s an intrinsic part of digital transformation’. “It’s very hard to argue with insights provided by value driven data. So once you’ve figured out where the company is going and what the role of digital is in that, step three is to get the resources to implement the strategy. “When I’m pitching digital services like the robots-as-a-service, I do a work up on what it would mean, how it would work, what the charging model would be, what the cost base would be, and what the expected sales could look like. “TBM is an important part of going digital. It’s not just about technology It’s about people, process and technology. Always the three together. If you don’t have that as your guiding principal, you are going to fail,” he says.